Call recording is very helpful for several reasons. If you have been thinking about what features to add to your call center services, then maybe you have been hesitant about call recording. Perhaps you are afraid that the privacy concerns that are associated with recording calls will turn customers away. However, the truth is that call recording is very helpful for several reasons. Call recording helps you give your customers the best service possible. Simply verifying a customer’s phone number or credit card information can turn into a hassle without it. You can always reassure your customers that their personal information will be kept private and, if need be, the recording can be deleted. With a virtual receptionist that types messages from audio, you get the added benefit of a copy of information that you can file more easily for future reference. Whether you find yourself faced with an angry customer or a legal dispute, call recording will protect you. It’s common for misunderstandings to crop up from a phone conversation, and you or a customer may remember different things about the conversation. A recorded conversation gives you the concrete evidence to determine what was and wasn’t promised to find the source of the misunderstanding. And this is critical to saving your company from a lawsuit. Not only does providing a record of the conversation significantly increase your credibility, but your lawyer will be much more likely to win the case. Anyone who has used a call service as a customer has heard “this call may be recorded for quality assurance.” But that line that isn’t just a formality. It lets customers know that the call center representative they’re talking to will be held accountable. Quality assurance is key to helping your business improve and thrive. Call recording helps the answering service know that their representatives are providing good quality service. Get in Touch with TeleRep Today! TeleRep knows how important call center and answering services are to your company. We are well known for our professionalism and excellent customer service when dealing with your valued customers. 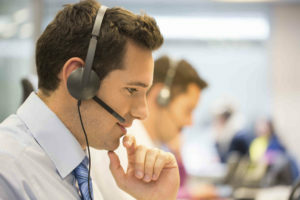 Let your customers know you care, right now, with our live answering services. To learn how TeleRep can help set your business apart, contact us online or give us a call at 1-800-638-2000. To see more examples of what we’ve done, follow us on Facebook, Google+, Twitter, LinkedIn, and Pinterest. This entry was posted on Monday, March 25th, 2019	at 5:08 pm	. You can follow any responses to this entry through the RSS 2.0	feed. Both comments and pings are currently closed.